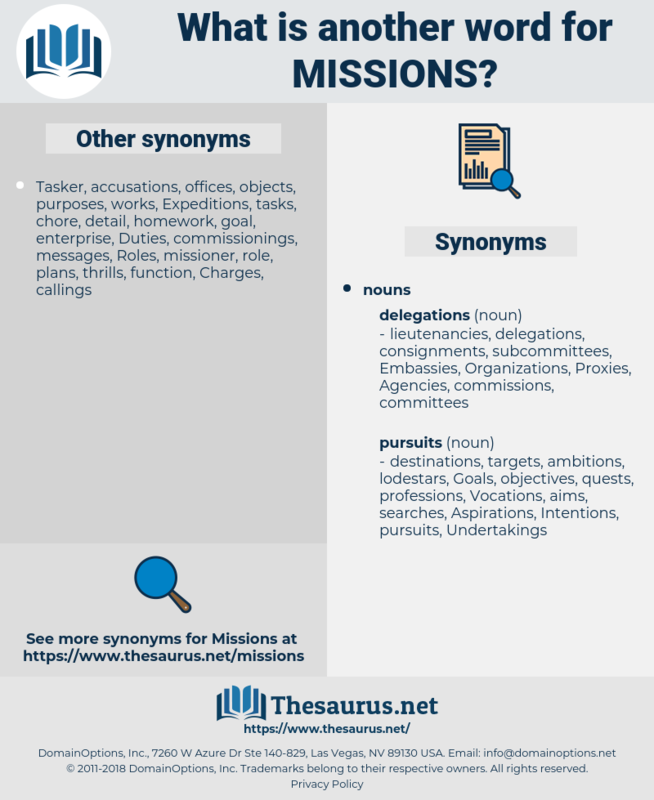 What is another word for Missions? commissions, submissions, trips, emissions, Embassies. representatives, nations, Companies, relations, FFMS, OCS, Goals, visitors, states, Elles. 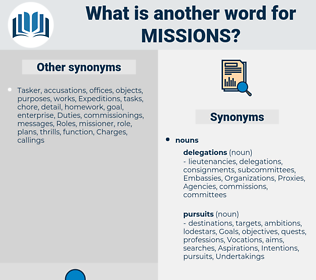 expedition, inspection, responsibilities, ISAF, assumes, interview, beijing, Eri, enquiry, putting, study, Elles, guests, Them, entry, pi, They, put, delegations, MINURSO. institutions, organisations, investigations, Expeditions, Organizations, positions, observations, responsibility, situations, interventions, incursions, inspections, commitments, corporations, representation, representations, promotion, presentations, representatives, headquarters, jobs, deployment, deployments, taskings, troops, bombings, actions, deputations, authorities, locations, transactions, establishments, enterprises, requirements, times, endeavours, things, violations, Investments, Perceptions, credentials, interests, Stations, initiatives, tours, objectives, occasions, committees, committed, aims, depictions, consignments, retention, factions, Investigators, Journeys, Undertakings, Companies, Businesses, Capabilities, inspectors, performances, sorties, relations, Achievements, rooms, courses, ops, flying, applications, envoys, disbursements, shipments, represents, commercials, Efforts, Exercises, OCS, outings, assistant, Interviewing, remits, organs, Opportunities, talks, stockpiles, patrols, aircraft, Agencies, orders, reasons, programmes, teams, scrambles, Programs, projects, Movements, displacements, dealings, presences, issues, mailings, offices, dispatch, officials, banks, voyages, reports, deeds, stocks, works, Firms, flights, sites, Surveys, steps, advancement, targets, maintenance, priorities, challenges, processes, Ones, Interviews, Distances, strengths, Activities, development, responses, events, details, Entities, items, stakes, raids, planes, topics, expenses, broadcasts, others, Goals, visitors, orchestras, units, withdrawals, services, owners, portrayals, images, ways, structures, colleges, moves, Measures, Vehicles, contacts, troupes, acts, contracts, Studies, Branches, officers, war, Shelves, surgeries, uses, ceilings, Factories, powers, delegates, departures, Travels, Capacities, Charges, squads, enquiries, audits, executive, routes, warrants, framework, rules, data, peace, shifts, objects, roads, merits, shows, frames, hits, attacks, Paths, Facilities, Strikes, appliances, cases, facts, Bureaus, outputs, agents, partners, Bodies, Countries, Prices, centres, parts, deputy, aspects, desks, outlets, Forms, speakers, practices, responsibilities, Areas, Parties, outflows, Plants, features, racks, enclaves, Plays, buses, subjects, exits, ties, discharges, theatre, theatres, builds, feelings, members, types, athletes, calls, figures, dates, Elles, guests, delegations. aims, differs, cruises, calls, delegations. purposes, Roles, regiments, cruises, convoys, tasks. But, I repeat it, these two missions of the law contradict each other. The baptism books of these missions have been preserved, and two copies have been made. mazama, Miasm, mannikin, misname, mexican, mahican, Mishnah, mug's game, may queen, mucuna, mucin, munchausen, muazzin, manikin, mexicano, macoun, mnemosyne, meson, michigan, mezzanine, maximian, myxoma, mencken, magazine, macho-man, mannequin, meccano, machismo, mancunian, magnum, magma, maugham, manna gum, muskhogean, mean sun, meniscium, mycenaen, mycenaean, mocassin, meconium, meningioma, mizen, Mishna, monsoon, mansion, mason, monogyny, mackinaw, mycenae, meshuggeneh, masochism, mock sun, museum, misogamy, manakin, moonshine, mizzen, miasma, moccasin, maoism, mommsen, musician, Manichaeism, Manichaean, makin, monogamy, monism, mu-meson, miocene, munchhausen, monacan, momism, mahayanism, mazzini, misogyny, massine, minus sign, minocin, Manichean, manson, mix in, machine, magician, mass noun, manumission, monosomy, mohican, muskogean, myosin, mikania, messina, megohm, misocainea, mckim, maxim, mahogany, monosemy, Manzoni, meningism, mosaicism, muenchen, maximum, mackem, muezzin, myxine, mosan, macon.